It was a night of glitz, glamour and celebration of Nigeria’s visionaries at the Eko Hotels Convention Centre, Lagos, venue of the 2018 The Sun awards where 23 distinguished Nigerians were honoured in different categories of the annual event. The ceremony began at exactly 7pm with musical performances. Soon after the national anthem was rendered, Managing Director/ Editor-in-Chief of The Sun Publishing Ltd, Mr Eric Osagie welcomed guests and the awardees who he described as visionaries in their chosen fields of endeavours, to the 16th edition of the glamorous ceremony. He urged Nigerians to remain optimistic about Nigeria, saying the country has a bright future. He congratulated the awardees on their honour, saying picking 23 out of over 180 million Nigerians was not an easy task. “16 years after, we seek to prove the point that Nigeria is a great country with great people. Nigeria is not finished. Today, we have 23 awardees in the country of 200 million, to pick 23 awardees is no mean task,” he added. Mr Osagie lauded his predecessors Mike Awoyinfa who started The Sun Awards, Tony Onyima and Femi Adesina for nurturing the awards to becoming the biggest media awards in Africa. Eminent businessman and the former Governor of Abia State, Dr. Orji Uzor Kalu, who is also the Chairman of The Sun Publishing Ltd, said the destiny of Nigeria lies squarely in the hands of Nigerians. He said he has no doubt that Nigeria would be greater and achieve her potential if all Nigerians contribute their own quota especially by doing the right things at the right time. He assured that by so doing, Nigeria would take her place among the comity of nations. Represented by his daughter, Mrs. Neya Iyere, he tasked Nigerians to replicate the kind of passion, zeal and oneness they display while watching sports contests in which Nigeria is taking part. Kalu, who is the Publisher of The Sun Newspapers, said the Nigerians that were recognised had done something remarkable and extraordinary to have been singled out for recognition. He said they had contributed immensely in their various domains – locally and internationally, to greatly impact lives. “I am delighted to welcome you all to this event to recognise great Nigerians on their tremendous contributions to socio-economic and political development of the country. I congratulate all the winners because they have done something remarkable, which should not be ignored. 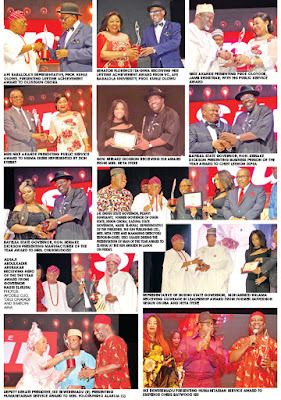 The awardees should be proud of their accomplishments just as The Sun Publishing Limited that is recognising them. “We should make sacrifices and show love and oneness that we exhibit when our national feature is in any contest. It is the good things that we do as individuals that will translate to the Nigeria of our dream. We are the ones to make this happen,” he said. Those honoured at the event include: Mallam Nasir El-Rufai, Kaduna State governor, who received his diadem as Man of the Year; Governor Ifeanyi Ugwuanyi of Enugu State (Governor of the Year); Bayelsa State governor, Seriake Dickson (Most Outstanding Politician of the Year) and Governor Kashim Shettima of Borno State (Courage in Leadership). 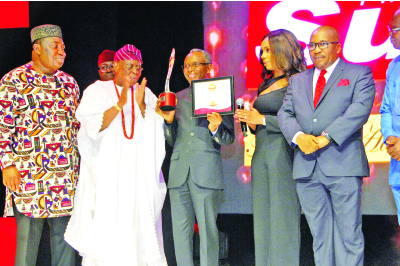 Others who received awards include Sir Daniel Chukwudozie, chairman, Dozzy Group (Manufacturer of the Year); Chief Leemond Ikpea, chairman, Lee Engineering & Construction Ltd (Business Person of the Year); Mr. Nnamdi Okonkwo, MD, Fidelity Bank Plc (Banker of the Year); Emperor Baywood Ibe, chairman, Baywood Foundation (Humanitarian Service) and Mrs. Folorunso Alakija, richest black woman and Chairperson, Rose of Sharon Foundation (Humanitarian Service). First Lady of Rivers State, Justice Suzzette Nyesom-Wike, received the Most Supportive First Lady of the Year award, with Mr. Nsima Ekere, immediate past Managing Director, Niger Delta Development Commission (NDDC) and Registrar of the Joint Admissions and Matriculation Board (JAMB), Prof. Ishaq Oloyede who got Public Service awards. 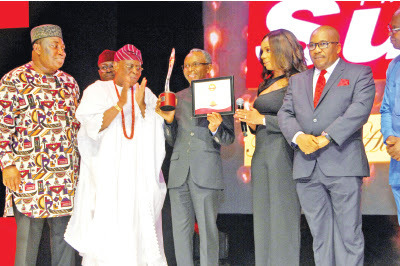 The Lifetime Achievement award went to former Ogun State governor, Aremo Segun Osoba, iconic musician, King Sunny Ade and Senator Florence Ita-Giwa, while Aare Afe Babalola (SAN), legal luminary and founder of Afe Babalola University, got Education Entrepreneur of the Year award. Two people who received the Nigerians Hero award for their extraordinary heroic feats are Mr. Joe Blackson, who died after saving 13 people in a boat accident and Alhaji Abubakar Abdulkadir, a Muslim cleric, who saved about 300 Christians from being killed by herdsmen. In their reactions, the awardees expressed appreciation to The Sun for finding them worthy of recognition. Kaduna state governor, Nasir El-Rufai said. “I am greatly honoured to stand before you on behalf of the people and government of Kaduna State to accept the honour of The Sun Man of the Year award. I have attended this event in the past when some of my close friends were awarded the same honour. I attended when my friends Nuhu Ribadu, Chukwuma Soludo, Chibuike Amaechi and Oby Ezekwesili were awarded and I was there to felicitate with them. I am very happy to join this illustrious list of very credible Nigerians and I want to thank The Sun Newspapers for the honour; I hope I will not let the paper and its reputation down. “Nigeria needs leaders that will unite and not divide us; leaders that will bring progress and not retrogression. The Sun Newspaper is a veritable platform for the unity of Nigeria and that is why I am very proud to be associated with it. The governor of Enugu State, Ifeanyi Ugwuanyi while appreciating the Governor of the Year award said that his state is in the hands of God and responsible for the success of his administration. Ugwuanyi who was accompanied by a crowd of supporters added that only cooperation can move the state forward. He said: “I like to appreciate all on this great honour on my family and the people of Bayelsa state. I want to thank The Sun for their boldness on the award. African’s richest woman, Mrs Folorunsho Alakija and Emperor Chris Baywood Ibe dedicated their humanitarian Award to Nigerian widows and wife respectively. Alakija said it was a privilege and honour to be awarded and thanked God for the strength to help the less privileged. Baywood classified the award as the ultimate award. “This award is ultimate and I dedicate it to my wife for her support. If she does not, I would have not been able to do more with Baywood Foundation,” he stated. In his acceptance speech, Chief Osoba dedicated the award to all the reporters who are still active in reporting, saying that he still remains a reporter and would die a reporter. He thanked The Sun for the award. In her response, Senator Ita-Giwa expressed gratitude to The Sun for giving her the award in her life time, saying that she preferred lifetime award to posthumous award. She said her election into the Nigeria Senate has helped her to do a lot for her people, particularly the resettlement of Bakassi people. She also promised to continue to fight for the good cause of her people. Professor Kunle Olowo presented the lifetime awards to the recipients on behalf of Chief Afe Babalola, who could not make the event. The entertainment content of the event was well delivered by Nigerian music sensation Tiwa Savage who thrilled the audience at the biggest media event in the country. Savage, who returned from the United Kingdom within the week for The Sun Awards, entertained the audience with her band and dancers. Also, the evergreen Veentage Band, among other top artistes, including popular comedian, Bovi also thrilled guests.